Chalk Pastel Art for All Ages Bundle - You ARE an ARTiST! View cart “You ARE an Artist! Curriculum Bundle” has been added to your cart. With our Art for All Ages Curriculum bundle, you have the core of our art tutorials at easy access. Master Artist, Lucia Hames (Nana) shares step-by-step directions to teach all your ages – just add chalk pastels and paper! Also a fantastic resource for older art students to enjoy independently. Getting Started in Chalk Pastels combines all our best tips and encouragement for enjoying the chalk pastel medium. From the short supply list to starting art with young children to teaching multiple ages to how to do art in 5-10 minutes. A Simple Start in Chalk Pastels – over a year of art tutorials. A wonderful place to start your art adventure with landscapes, simple shapes and classic art subjects. Chalk Pastels Through The Seasons – celebrate each season with the beauty of art. Kick off a sports season, enjoy a scoop of ice cream and more. 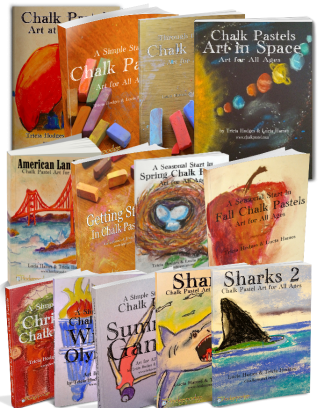 American Landmarks: Chalk Pastel Art for All Ages – let’s take a tour of American Landmarks from sea to shining sea! This compilation of stunning landmarks combines art and history for a more challenging art time. 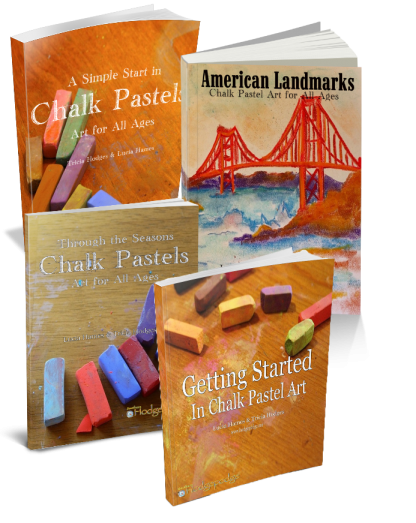 Our most popular chalk pastel art books are available for a special low price in the Chalk Pastel Art for All Ages curriculum bundle. Get yours today!